This article will help you to understand what is Struts Tiles and why do we use it and also how to write an application using struts tiles. Struts Tiles is a template management system that is used to create and manage web application templates by using struts framework libraries. Tiles can be used using struts and without using struts. The newer version of tiles (Tiles2) is used without using struts framework to create web application templates that helps the web application theme and contents to be managed easily. Above figure shows contents of a web application manages by tiles, where application contents are spited as Web Application Header, Left Content, Middle Content, Right Content, and Web Application Footer modules. These modules are summarized in a single module using struts tile, while these are managed independently. Using Tile insert tag inside the JSP Page. 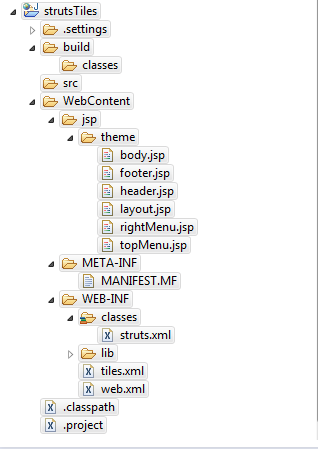 By Defining a Tiles definition tag inside the JSP Page. By Defining a Tile in XML file and load it from a factory using Tiles insert tag. We will have a look on all these mechanism in this article to create a web application using tiles. 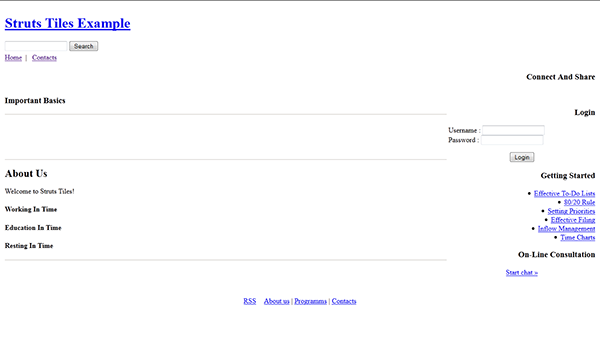 Step 1: Create a layout.jsp file for our web application that will web application template schema or structure. The above code table defines the struts configuration xml file that has first tag is the Document type descriptor. The next and the root tag is <struts> tag having the packages description using its sub-tag <package>. There is a one package defined in this configuration file, which is the default package. The <package> tag contains sub-tag <result-type> that has the specification of tiles configuration xml file. The next sub-tag is <default-action-ref> that loads the default action on startup and <action> and its sub-tags. The <action> tag define the action to be performed on request. The performed action is decided on result-type using <result> tag. This file defines the tile configuration of the struts application template. The first tag of this file is <!DOCTYPE> that is the document type descriptor. 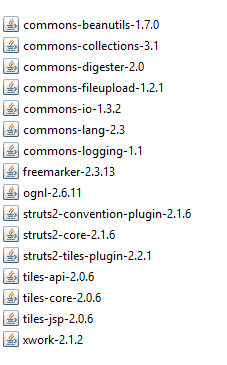 The next root tag is <tiles-definitions> that defines the tiles configuration using its sub-tags. The tag <definition> is the sub-tag of <tiles-definition> defines the theme jsp file specification, in which the tile structure is being created. The structure is created using the sub-tag <put> of <definition> tag that describes the jsp file to be used as tile in the specified jsp file of the <definition> tag. The web.xml configuration file is web application descriptor file, that handles the flow of control and passes all requests coming from the clients to struts.xml configuration file using tag <filter> tag. The root tag of this file is <web-app> contains the sub-tags <filter> <context-param> and <listener>. The <listener> tag is used to enable the functionality of tile configuration in this application. The above code defines the layout.jsp file and accepts 5 other jsp files as tiles of this layout file. To access tiles into the jsp page, tag name <tiles:insertAttribute name = “<tiles-name>” /> is used. <%@ page language=”java” contentType=”text/html; charset=UTF-8"
The above table defines the contents for the jsp file header.jsp that will be displayed in the header tile area of the layout.jsp. The above table defines the contents for the jsp file topMenu.jsp that will be displayed in the topMenu tile area of the layout.jsp. <%@ page language=”java" contentType="text/html; charset=UTF-8"
The above table defines the contents for the jsp file rightMenu.jsp that will be displayed in the rightMenu tile area of the layout.jsp. The above table defines the contents for the jsp file content.jsp that will be displayed in the content tile area of the layout.jsp. The above table defines the contents for the jsp file footer.jsp that will be displayed in the footer tile area of the layout.jsp. These are the jar files that are required to run this application struts tile application. The above figure shows the directory structure of the application in Eclipse IDE. What are tiles and their types? How to write a web application using tiles?